We have a great range of slices in that are very delicious and perfect for any occassion. Some of these include our caramel slice, chocolate fudge brownie, hedgehog, rocky road and the mouth watering choc cherry slice. With a huge variety of treats that are bursting with flavour, we believe we have the best slices in Melbourne. Come check us out! 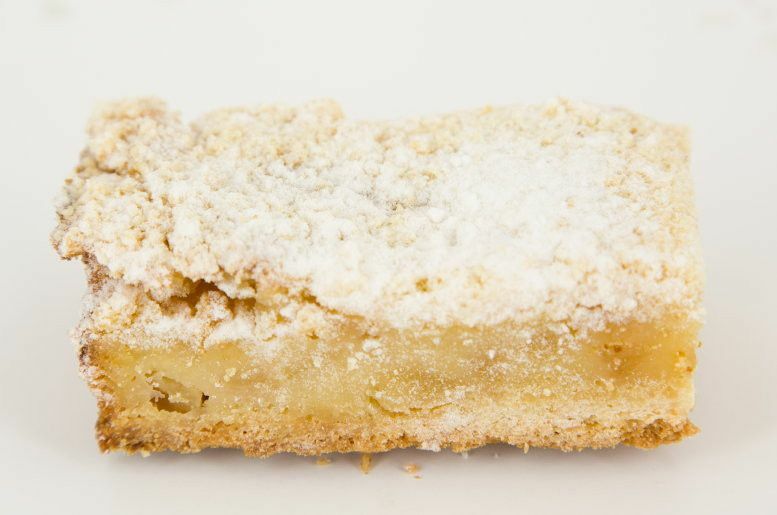 A biscuit base is topped with a thick layer of Australian apple and a sweet crumble. A delicious chewy slice filled with apricots and flavoured with coconut. A crunchy biscuit base and indulgent layer of smooth rich caramel is finished off with a dark chocolate topping. A chocolate biscuit crumb base is topped with a cherry and coconut mix and then covered in chocolate icing. Chef Momo’s iconic fudge brownie is an intensely chocolate flavoured slice which is moist, chewy and addictive! A crunchy cookie base is topped with a rich creamy icing and a sprinkling of cocoa. This is a dark chocolate slice which is studded with crispy biscuits and topped with a layer of chocolate icing and a scattering of flaked almonds. (contains gluten, egg, dairy, tree nuts, soy). A chocolate fudge brownie base is covered with crunchy chocolate honeycomb and a layer of chocolate ganache. (contains: gluten, egg, dairy, soy). A crunchy biscuit base is covered with a generous layer of creamy caramel and then a scattering of roasted macadamias, walnuts and almonds. (contains: gluten, dairy, tree nuts, soy). Lemon slice is one of the most popular choices because it combines sweetness with the tang of lemons. A biscuit and coconut base is topped with citrusy lemon icing. A chewy choc mint base is covered with a creamy mint icing. A healthy blend of oats dried fruit and honey is then covered with a layer of fresh lemon icing and a scattering of fruit, seeds and nuts. This is a guilt free and delicious option. A crunchy biscuit base is topped with an orange citrus icing and a generous sprinkle of roasted macadamia nuts. This is a different take on the ever popular lemon slice. A biscuit and coconut base with a distinctive passionfruit flavour is topped with a refreshing passion fruit icing. A dark chocolate fudge base is covered with fluffy pink and white marshmallows and then topped with chocolate icing. The combination of smooth rich caramel which has been sprinkled with sea salt on a crunchy biscuit base delivers a surprising sensation of sweet and salty. A chocolate fudge brownie base is covered with roasted almonds in a toffee mixture. - Available in box of 10 or 32. A chewy white chocolate slice is studded with cranberries and topped with flaked almonds. Dark chocolate fudge base has been covered with white marshmallows, white chocolate and cranberries. This is a popular choice for Christmas. A chewy coffee flavoured biscuit base is topped with a creamy espresso flavoured icing. This chocolate fudge brownie base is covered with a generous layer of roasted macadamia nuts. The healthy eater can still have a treat. This protein slice is sugar free and full of healthy fruits, grains, seeds and nuts.